European Springs make springs for a variety of different functions and industries, from medical pacemakers to motor engines. A new running trainer has been released today which uses the same springs as those used in mattresses to make a much more comfortable shoe which is hoped will diminish running injuries. The shoes make use of miniature pocket springs in the design of the trainer’s sole. Pocket springs are compression springs which are nested in a fabric casing. Conventional running shoes have layers of foam or gel to lessen the impact associated with the foot hitting the ground at speed but the problem with this technology is that, whilst it does act as a buffer, it does nothing to improve the springiness of the shoe. Designers have experimented with several types of shock absorbers but none seem to have reduced the number of running-related injuries. Over the course of a year, injury can plague up to 70% of recreational runners so it is important to come up with a solution soon. Several tiny springs embedded throughout the sole significantly reduce the loading rate in these new trainers. It is believed that they will reduce the injury rate in wearers by 10%. This new trainer has been launched at the Royal Society’s Summer Science Exhibition. The inventor, Professor Jim Richards of the University of Central Lancashire is justifiably proud of his creation. The trainers have been produced independently but it is possible that his design will be picked up by major sports shoe brands in the future. This innovation is indicative of the vast usability of many types of springs. Several inventions require custom springs at the prototype level; European Springs are able to discuss this with designers to ensure springs that are engineered to suit every product perfectly. The Twitter page is a great resource for news and information about new springs. 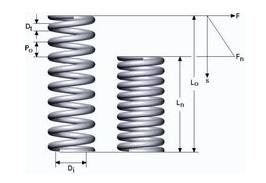 New springs are constantly being developed as solutions to all sorts of problems and existing spring types are also remarkably versatile. To keep up to date with industry news and other interesting stories, follow our Twitter page which can be found at https://twitter.com/europeansprings.